As the Lincoln Saturday League moves into the business end of the season, all four of the title contenders were in action and the results on the day saw two of the sides’ aspirations virtually vanish. While leaders Horncastle Town Reserves were suffering defeat, nearest rivals Fulbeck United and Cherry Willingham were in opposition for a third game in a row, the previous two being cup ties. In actual fact the two side were meeting for a fourth occasion and Cherry had yet to win. Fulbeck’s form was one of the best of late, having won five of their last six matches while Cherry’s was perhaps one of the worst with five defeats in their last six. Despite this poor form, Cherry produced a match winning performance and picked up all three points with a 4-2 win. Netting Cherry’s goals were Jake Mann (2, his 16th), Joe Ayres and Liam Lynch with Will Allen (his 16th) and Callum Clay (his 12th) scoring for Fulbeck. Horncastle were playing their last away game as they visited Railway Inn, who themselves were concluding their home programme. The Wongers were after a third league double but in recent weeks their title hopes have waned as they have lost their last two league games. Railway on the other hand had seen an upsurge in form over the last couple of months, suffering just one defeat in their last five games. This form was taken into this game and theyetched out a 3-1 win. Scoring their goals were James Smith (2, his eithth goal of the season) and Tom Holmes (his 9th). Rob Morey netted for Horncastle with his 14th goal of the campaign. This left just Birchwood of the title contenders and they visited lowly Retford Town. The home side were playing their final home match and had not won a game for three matches while Birchwood were the last unbeaten side in the league – with a comprehensive 5-0 win, Birchwood kept a sixth clean sheet. On target were Danny Kent (2, his 9th), Liam Uzzell, Jamie Corby and Paul Nicholson (his 14th). 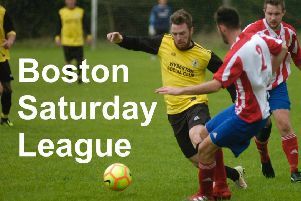 The final game had no bearing on the title race as bottom side Saxilby Athletic entertained mid-table Ruston Sports. A 2-0 win for the Lincoln side saw them record their first league double of the season and a third win in a row, their best run of the season. Ryan McCullough and Harvey Melady scored the goals. Putting all these results together means that Horncastle remain at the head of the table but their lead is now down to just two points from Birchwood United, who have four games in hand. One point further back are Cherry Willingham who have three games in hand over Horncastle, while Fulbeck dropped from second position to fourth, five points adrift, having played two games less than The Wongers. At the bottom of the table, Saxilby remain embedded at the foot while Railway Inn climbed out of the bottom two, relegating Retford to this position. The Amateur Cup final takes place at Lincoln Moorland Railway on Thursday evening when Birchwood United take on Fulbeck United, 7.30 pm kick-off.